A few years ago, when I was playing more music than I am right now, I was sitting on the patio of an Austin, Texas hotel with some friends during South By Southwest. In the lot next door to this hotel, there was a large billboard. I started thinking that if I bought that billboard the next year, I could reach a ton of influential music people at the conference in one fell swoop. I decided it didn’t make good financial sense for me as a musician who made most of his money waiting tables and juggling freelance jobs, and I let go of the idea. Before this week’s Major League Baseball Winter Meetings had even officially begun, the Washington Nationals signed 31-year-old former Philadelphia Phillie outfielder Jayson Werth to a seven year deal worth $126 million. When it comes to the baseball that the Nationals will get from Werth, it’s hard to argue that they didn’t overpay, particularly when you consider he’ll be 38 by the time the contract ends and that he’s only put up noteworthy numbers for three seasons, while also playing in a Philadelphia line-up that provided him much protection. He’s good, but they spent a lot to get him to D.C. But in addition to paying for some baseball with this move, the Nats figuratively bought that big billboard over top the conference. They went into the winter meetings with a big megaphone and told the baseball world they are serious and ready to spend what it takes to be noticed, sign big-name players and be thought of as a contender. There’s a good chunk of marketing within this deal along with the baseball. Take what the Nationals will pay Werth and subtract from that what you feel he would have signed for with a team that would not need to overpay him. In addition to this money being what it took to get Werth to sign with Washington rather than with a big name, recently competitive franchise, that difference can also be thought of as a marketing expense or ‘free agent marketing dollars’—the cost of getting other players to pay attention and consider the Nats. This deal was part advertising and PR directed at the rest of the league’s players. If the Nats can lure a couple more big names via free agency or trade this year or next, and then capture an NL East crown or two in the next few years as a result, those marketing dollars will have likely been worthwhile. Granted, the team very well may have to overpay the next couple of free agents too. So let’s say they overpay them and Werth each by $3 to $5 million per season. Is it worth that extra $9 to $15 million per season over the going rate for those three players, plus the money you may now potentially have to overpay Ryan Zimmerman, Stephen Strasburg, Bryce Harper and others, to be a contender? Maybe it isn’t worth it (or affordable) for every team. But it could be when you have a net worth of $3 billion and are one of the richest owners in baseball, as Nats’ owner Ted Lerner is. And then once you’ve established yourself as a team that will do one of the things that attracts players—paying them substantial sums of money—you might start doing one of the other things that attracts them—winning. And suddenly the extra tens of millions spent each season look well worth it. So, I say, go after Cliff Lee hard. Pay him whatever it takes to get him to D.C. Give him the extra year or however many extra million it will take for him to sign here over New York, Texas or elsewhere. Baseball people are calling the Nats crazy right now in part because they have disrupted things, because this isn’t how it’s supposed to go. And I love it. D.C. is a power city and a major media market. That, combined with the deep pockets of its owner, should put the Nats right up there close to the Yankees and Red Sox of the world when it comes to being able to lure the biggest free agents. If you’ve got the money, Mr. Lerner—go all in! Get Lee and stop there for now if you’d like. Then re-evaluate at the trade deadline or next off-season and pick up some additional pieces. But don’t stop part way, with one foot of the team in a grow-your-prospects plan and the other foot with just a toe in a spend-like-the-Yankees model. The only way the Werth deal will look really crazy is if you stop with this one big signing and let all the “Hey everybody, look at the Nats! Sign with us!” money that you just spent go to waste. 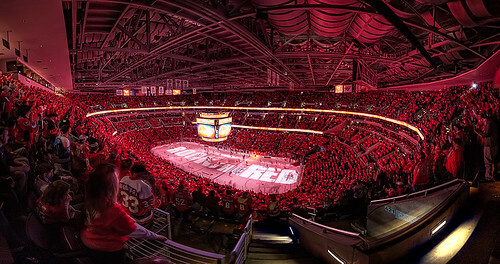 Will the Washington Capitals’ home sellout streak end anytime soon? The Washington Capitals‘ streak of selling out Verizon Center reached 74 games this past Sunday when they faced the Carolina Hurricanes. But fans shouldn’t take that to mean tickets are not available for upcoming games. As I mentioned a few weeks ago, tickets are available for Caps games on the resale market, but you can also get tickets directly from the team for most games. The Caps have a waiting list for season tickets but made the decision to leave some seats available for purchase every game, rather than sellout the entire arena on season ticket sales alone. With just a small number of seats available for many of the upcoming games, it appears unlikely the sellout streak will end anytime soon. “The numbers are low enough for each game that our typical walk-up crowd should keep the sellout streak intact through the season,” said Ewell. That would take the streak to 101 games. And how does that stack up against the NHL record for consecutive sellouts? That depends on who you ask. I have an email into the league office asking who can truly be crowned “NHL Consecutive Sellouts Champion” and will post an update if I hear anything back from them. But I imagine they’re pretty busy right now looking over my previous post and trying to figure out how to dynamite Civic Arena before a national TV audience on January 1. And if the Caps ever do set any records for NHL attendance, I wouldn’t expect any banners to be raised celebrating it — “Leonsis removes Mystics attendance banners”. I wake up the morning of the NHL Winter Classic a bit like a kid on Christmas…but who has to wait until 1pm to open his gifts. Watching the New Year’s Day outdoor ice hockey game—about to be played for the fourth year in a row—has quickly become a tradition for me and I find myself eying the clock, counting down the hours until the early afternoon game. This January 1, when the Pittsburgh Penguins host the Washington Capitals in the 2011 edition of the Winter Classic, I imagine the wait will seem even longer, as I’m a Caps fan and am anticipating the game even more than usual. The pregame show, hockey blogs and Twitter chatter—perhaps even the occasional glance and head nod to a member of the family—will no doubt help pass the minutes on New Year’s Day until the drop of the puck. But there’s one other thing that I wouldn’t mind seeing that day as I wait for some hockey to start. It involves dynamite, live television and a conveniently located, rather large structure that may already be headed toward extinction. Mellon Arena sits just about a mile from Heinz Field, the site of the 2011 Winter Classic. Also known as the Civic Arena, Civic Auditorium or The Igloo, Mellon Arena is the former home of the Penguins, who began playing in the CONSOL Energy Center at the start of this season. With the Penguins in their new home, Pittsburgh’s Planning Commission made a decision to demolish the Civic Arena. But last week, “Hill District resident Eloise McDonald nominated the 49-year-old landmark for designation as a city historic structure,” according to the Pittsburgh Post-Gazette (h/t Puck Daddy). I’ll leave the decision on whether or not to save The Igloo up to the city of Pittsburgh. Maybe they’ll find a way to keep it and put it to good use. And to be clear here, I’m not someone who will take pleasure in watching The Igloo get turned into a pile of rubble because it’s where one of my team’s rivals played its games. I’m more interested in how my team will do when they face the Pens for years to come in other arenas. But, if demo is the route the city chooses on this one, why not let us all watch it the morning of the Winter Classic? If the The Igloo is to go, Pittsburgh, let it be done in style. If you can’t find an outlet to broadcast it, take it to the web. Or maybe this guy with Pittsburgh roots and who c0-founded a TV network can help. 11 a.m. (with a half hour of televised build-up beforehand) on January 1 works for me. Roll old tape of Mario and past Cup winners, whatever you want to do. Make sure you get in some footage of the time Elvis played there and keep the wrecking ball at home—if the old barn is coming down, dynamite the joint and give us a show. And then everyone can head across the river to Heinz Field and create some new history. Disappointment about U.S. not getting 2022 World Cup, I understand. But why all the outrage? I completely understand if some people are disappointed that the U.S. was not selected to host the 2022 World Cup. There’s no doubt it would have been an amazing experience for soccer fans and even for some people who don’t follow the game closely. And the last time the U.S. hosted a World Cup, attendance records were broken. Only five countries have been selected to host the FIFA World Cup twice since the inaugural event in 1930: France, Italy, Mexico, Brazil and Germany (if you count that West Germany hosted in 1974 and Germany in 2006). Just one of those countries got their second chance to host the World Cup in less than 30 years—that was Mexico, who hosted in 1970 and again sixteen years later in 1986. France hosted in 1938 and then waited 60 years to host again in 1998. Italy hosted in 1934 and didn’t receive the honor again until 1990, a wait of 56 years. Brazil, who will host the next Cup in 2014, will have waited 64 years since they last hosted in 1950. East Germany hosted in 1974 and then Germany did in 2006, a gap of 32 years. As far as the game has come in the U.S. in recent years, I think it’s safe to say that soccer is much, much bigger in all these countries than it is in the states. And look at England—a country where soccer is huge and that just got passed over for the 2018 hosting duties. They haven’t hosted since 1966, so they’ve been waiting 30 years longer than the U.S. has been. So why all the outrage? The disappointment I get. What soccer fan wouldn’t be hopeful for an event like this to come to their country? But 1994 wasn’t that long ago, especially when you look at how long other countries have waited. Looking around Twitter, who the U.S. lost to is no doubt what has upset some people, with Qatar being a small country that has never qualified for a World Cup. But FIFA has shown a desire recently to take the World Cup to places it hasn’t been before and to further grow the game. In 2010, we saw the event take place on the continent of Africa for the first time. 2018 will be Russia’s first opportunity to host the event. And Qatar’s winning bid for 2022 means the World Cup will take place in the Middle East for the first time. Help me out here. If the U.S. hadn’t just hosted a World Cup in the ’90s, if soccer powerhouses hadn’t waited longer than we have to host their second World Cup, and if there weren’t regions who have never hosted the event before, I think I’d better understand people’s anger. Those of you who are outraged, what am I missing?